Furnaces – Because of our moderate climate, we don’t see as many gas furnaces as our friends to the north of us. Most homes outside of the Charleston SC area are heated with furnaces. In fact, there are many people who wouldn’t even consider a heat pump in their home. The main reason is that in areas where the temperature dips down close to 0°F, heat pumps do not perform as well. In addition, the heat that a furnace produces is much hotter than that of a heat pump. Furnaces distribute heated air through the duct work within the home. Replacing your furnace – Today, most furnaces operate at an 80% – 98% AFUE rating, depending on the furnace that you purchase. In the past, that figure was around 56% – 70%. There has been giant strides in improving the efficiency of furnaces. So, what does AFUE measure? AFUE (annual fuel utilization efficiency) measures the efficiency of a furnace. 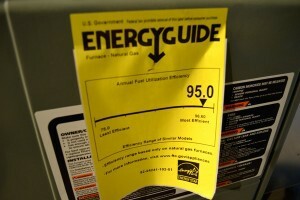 This rating is required by law to display this information so that consumers can compare heating efficiency. AFUE is the measure of how efficient an appliance is in converting energy of a fuel to heat over the course of a normal year. If you have a furnace that is rated at 98% AFUE, that means that for every $1 that you spend in fuel, 98 cents is converted to heat and the 2 cents is going out the chimney. Air quality – When dealing with gas furnaces, air quality is a very important concern that you should have. In order to ensure that you protect yourself from toxic fumes and keep the efficiency of your unit, be sure that your heating company checks your flue to be sure that it is operating properly, and that your furnace has the proper ventilation. If you are increasing the AFUE rating from 80% to 90% or more, a new flue must be installed to handle the gases that are being produced. The gases from an 90%+ furnace are more acidic in nature and need a different flue material. WARNING – As always, if you smell gas or gases, contact your utility company or your heating contractor. Failure to do so can have a very negative impact on life of your family and its well-being.